PDF Page Content Split (A-PDF Content Splitter) is available for you to split PDF files by the text content of PDF pages. It is a useful application that can split up a PDF statement on the basis of the account number. Also, it is easy for PDF Page Content Spilt to find out words in the PDF, mark start and end ranges. Then a new PDF will be automatically split out. Produce multiple PDFs from a single PDF based on textual content. Easy to use with the supported split methods. Support flexible tags if needed. PDF Page Content Split offers an efficient way for you to split PDF based on contents. It greatly fastens the progress that you search for the particular information. Using PDF Page Content Split, a file with hundreds of thousands of personal records can be output as many small files. All these files can be stored at a delimited file. And you can create directories for each small file. 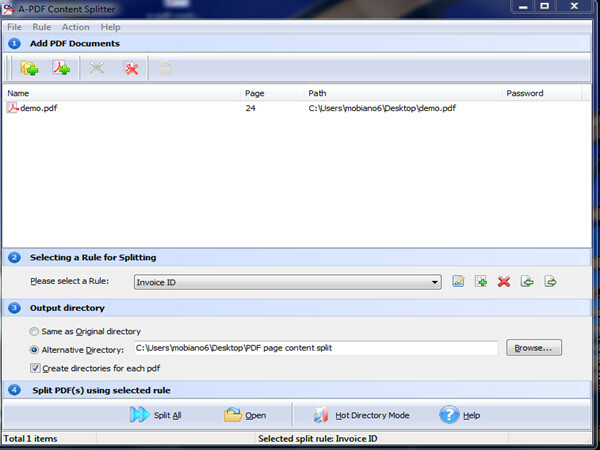 PDF Page Content Split supports you to set the split rules. In other words, you can make their own decision on how to split files and how to output the files. Even you can set different rules for different files It is all up to you. Once you have set your rules, just a few minutes the PDF will be split as you want. You just need to do three actions: choose your PDF, set the rules, and press the “Split all” button. Page Content Split will automatically search and compare the text in given positions in every page, and split the PDF when the next page has the text in the given position different from that in current page.